Feeling the heat of competition from online sites, used car traders are banding together to set up their own portal. A group of 20 traders led by Mr Eddie Loo, managing director of CarTimes Automobile, is raising $5 million with the aim of rolling out the site by early next year. 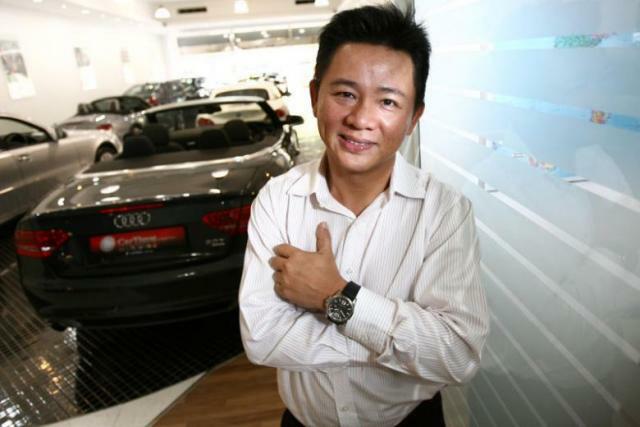 "The online presence is eating into dealers' business," Mr. Loo told The Straits Times. "We need to protect our business before it's all taken away from us." He said competition has been coming fast and furious, in the form of such entities as sgCarMart, Carousell, Carros and ------. "And we find it's meaningless for us to support these online portals when they are competing with us," he added. Carousell, for instance, has muscled into the car domain, while sgCarMart has just started a car financial services arm. "Our aim is to become the largest online portal... to create a new marketplace for dealers," Mr. Loo said, adding that the yet-to-be-named site will be run by 'a professional team'. "It won't be run by dealers, so that it won't be one-sided," he added. "Every dealer will have a stake, so that their interest is protected." He said the business-to-consumer site will cater to motorists who want to buy or sell vehicles, and it could eventually allow deals to be done fully online. "It's still preliminary," he added. "The $5 million is just the first phase." Mr. Loo said the investment will go into hiring a team as well as marketing efforts. "There's a lot of marketing to be done," he noted. The used car trade is in the doldrums on account of depressed Certificate of Entitlement (COE) prices, which have rendered vehicle stocks bought with higher premiums commercially unviable. The slowdown, which started in July when COEs for cars up to 1,600cc fell to eight-year lows, has claimed at least one company. Shen Tat Enterprises has shut down after nearly 30 years in the business. I am skeptical about it. Mkt so small with so many portals got use? Edited by Ody_2004, 08 November 2018 - 02:53 PM. What is the difference from this car portal with others existing car portal ah? Their business bad nothing to do with portal. Is mainly bad economy and low coe price. They can setup 10 portals and won't improve their business. Think just go tech can save the world ah? Other then SPH's Sgcarmrt, any other more active/useful ones? Technology is removing the middle man in many trades, they are putting the middle man back via technology..... regression? Car dealers to pool $5 mil all in? I guess they learnt from the best. best at self praise and self check. Online portal? What is this? Year 2000? 5million is a crazy amount of money to build a portal. Even with marketing thrown in. Smells dodgy. As always with used car dealers. Here, right here is why it will fail. "Every dealer will have a stake, so that their interest is protected." Instead of looking at consumers interest, they are trying to look after their own. Sounds like gahmen. Too bad buying and looking at used car got real valid alternative choices. This will most likely fail unless they can do something that is really different from all other avenues that are already out there. With benefits to consumers or at least making consumers lives better. The way I see it, no it won't. That 5 mil will go to someone's pocket swee swee. Edited by Mockngbrd, 09 November 2018 - 08:21 AM. Haha...can see a number of ppl do not like to deal with used car dealers. Just look at the negative comments. LoL... I think me included but can only blame themselves for the situation they are in. What they are saying is simple. With their investment in the online portal they will less likely be like those small dodgy companies that will take car buyers' deposit and run road. Most likely see better customer service cos car buyers will be likely to review and post +/- comments. To them is a lot at stake. Imo it's a way forward for used car dealers cos most car buyers do not have a good impression of them. They will not behave like pirates or gangsters....maybe not so often as they like....and attract more buyers. Otherwise they will become like the sim lim square kenna blacklisted by everyone. With most listings by used car dealers anyway, might as well ga gi tan! 58 dollars saved per car, if the dealer sells 50 cars a month, that's 34K a year! Competition is good - maybe sgcarmart will lower the listing fees ($18?) when I need to sell my car. The 5 million keep and give out discounts to customer more better. Actually the listing fee is the least of my concern when it comes to selling my cars. It's the whole second hand car industry's business ethics and culture that needs a major shake up that simply starting a car portal themselves are not going to cut it. Every business needs to make money. But making money with every known (or unknown) unscrupulous methods to maximize profit at customer's expense is what makes this industry a necessary evil. The day you decide to sell your current car to change to another car is fraught with trepidation on the prospect of having to deal with the 2nd hand dealers. I, for one, will rather sell or buy from direct buyers/sellers than these dealers if possible. The MOF/IRAS should breath down harder on this group of business.